Congratulations to Kate Dilger from the SA Science Teachers Association who won the TRB Induction and Mentoring Early Careers Award at the Educators SA World Teachers Day Awards. The award is given to an individual who has made a significant difference to early career teachers and aims to highlight the importance of educators working with early career teachers. Kate Dilger from the SA Science Teachers Association pictured with TRB Registrar, Dr Peter Lind. Hiroshi Haga, who received the World Education Forum (SA) Educators Award, and Natalie Bond from Port Elliot Primary School and April Hague from Allendale High School who won the Minister’s Arts Awards. The Credit Union SA Early Career Teacher Awards were granted to Samantha Francis from Seaford Secondary College and Trent Phillips from Drama SA. 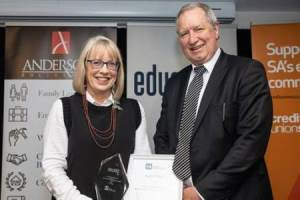 The Innovative Association Award went to the Japanese Language Teachers Association of SA and the Design and Technology Teachers Association of SA received the Connecting our Education Community Award from Andersons Solicitors. The Teacher Supporting Teachers Award was presented to Mei Turnip from the Indonesian Teacher’s Association. 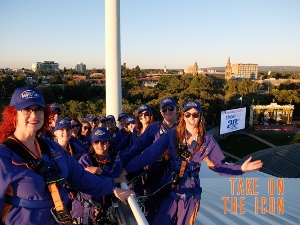 Our fourteen RoofClimb winners appreciated the perfect weather for their climb to celebrate World Teachers Day and enjoyed a beautiful sunset and breathtaking views of Adelaide. The winning teachers were: Erin Coppins, Alora Sharp, Ellen Barr, Debbie Thorley, Jane Glasson, Jenny Chapman, Margaret Crohn, Tom McLean, Dennis Errock, Cynthia Meredith, Dipleen Arneja, Gillian Rowse, Josie Brown and Stef Sotora. The Migration Museum is holding Wandering Wednesdays – Teacher Open Night on Wednesday 21 November, 4:30-6:00pm. Wander around the museum and explore the education programs and their links with the Australian curriculum. Learn how to integrate an education visit to the museum into your curriculum plan and meet with the Museum Officers, Curators and Education Manager. This is a free event must you must RSVP here. Being Religiously Responsive to Australian Muslim Learners: Are there limits? Australian learners are super diverse (Hattam and Rigney, 2018). And learner diversity is super complex (Memon and Chown, 2018). Being culturally and religiously responsive to learner diversity is good teaching practice (AITSL, 2011) and equitable practice is a national education priority (Melbourne Declaration, 2008). But what does being religiously responsive mean and look like in practice? This public lecture will use Australian Muslim learners as a case example of the complexities of being culturally and religiously responsive. Attendees can anticipate leaving with practical school-based approaches of enacting religious responsiveness. A free lecture but please book here as there are limited tickets. 15 February, 9:30am-4:00pm at the South Australian Jockey Club, 79 Morphett Road, Morphettville. Super early bird member rate $216+GST and non-member rate $240+GST end 30 October. Standard price $330+GST. The Modern Language Teachers’ Association of SA (MLTASA) is holding an Australian Teaching with Comprehensible Input Language Conference on Thursday 17 – Saturday 19 January, 2019 at Victor Harbor R-7 School is now fully booked. If you would like to go on the wait list click here. For further information call Annie Beach: 0400 850 030 or email here. Little Lessons Australia is holding Happy, Connected and Resilient Schools with Madhavi Nawana Parker behaviour consultant and published author. Monday 21 January 2019, 9:15am-3:15pm. At Navigator College 61 Windsor Avenue, Pt Lincoln. Cost: $175pp includes lunch and morning tea. Register here. Learning 4 All is holding A Team Approach: Supporting students with intellectual disability, developmental delay, down syndrome and chromosomal disorders. All staff and parents welcome. On Monday 26 November, 9:00am-3:30pm at The Highway, 290 Anzac Highway, Plympton. Cost $145. For further information or to register click here. Empowering Little People is holding a free Educator Wellbeing Breakfast - How to practically support your wellbeing in early childhood education. The breakfast includes a talk by Shameela Khambhaita on the topic of ‘The Importance of Our Individual Wellbeing in the Education Industry’ and a workshop on ‘How to Practically Support our Wellbeing in Early Childhood Education’ by your host Kerryn Barwick. On Saturday 1 December, 7:45am-10:00am at South Port Surf Life Saving Club, Weatherald Terrace, Port Noarlunga South. To find to more and to book click here. The Migration Museum, Parliament House and Centre of Democracy are holding a free full day of teacher professional learning day on Monday 17 December for teachers of HASS, Civics and Citizenship. The hands on sessions will cover all of the learning programs available in the HASS History/Civics & Citizenship areas at Parliament, the Centre of Democracy and the Migration Museum. You must register by emailing Natalie Young by 10 December to attend this event. Understanding the Autism Spectrum. Monday 26 November, 4:15pm-6:15pm, members $175, non-members $185. Autism SA, 262 Marion Road, Netley. The Anxiety Curve: What to do when an individual on the spectrum is escalating. Friday 30 November, 9:30am-4:00pm, members $175, non-members $185. Autism SA, Unit 1 / 57 Elizabeth Way, Elizabeth. Teacher Twilight: Explore the Centre of Democracy is being held on Tuesday 27 November, 4.30pm-6:00pm. Come and meet our team, and learn about the Centre, the thinking behind the design and selection of objects and the connection to the Australian curriculum. Parking available upon request. RSVP via Eventbrite booking.